Over the summer, we finally restored the flagstone walkway that leads to our front door. The project was very involved and took 4 weeks to complete, you can read about it HERE. You know that great feeling you get when you can scratch an item off your long to do list? And then the awful feeling you get when you realize you aren’t actually done with the project and there are issues you have to deal with, but would rather not? This is what the restored walkway looked like at the end of the project. We reused the flagstone which was still in very good condition, and laid new concrete. We were very happy with the final results. Not bad right? UNTIL…I asked my crew to straighten up the edges on both sides of the walkway. In order to do that, they trimmed back the shrubs for better access to the flagstone. Once the shrubs were trimmed…I noticed something. Umm….why does it look like the walkway has shifted to the left? The edges of the back section of the walkway do not line up with the edges of the front section. Or maybe it’s my imagination…and my eyes are playing tricks on me? I call my husband out to take a look and see what he thinks. Let’s get out the tape measure and figure this out. There is a good 10″ difference between the width of the front section vs. the back section! And when we use a piece of string and line it up along the right side of the walkway, there is an 8 inch difference in alignment between the front and the back! WTF?! Now what? This does not look like an easy fix. The front section of the walkway is already quite a bit more narrow than the back, so we can’t trim off more of the front edges to align it with the back. What to do? When it comes to home improvement projects, I like things done right. But I also understand that doesn’t always happen and like anything in life, we need to pick our battles. I can deal with slight imperfections and in this case a small misalignment…but 8 inches seems more than a slight imperfection! After putting a lot of thought into the issue, I decided to call my crew and have that chat I would rather avoid. The discussion went well and they offered to fix the issue…the right way. 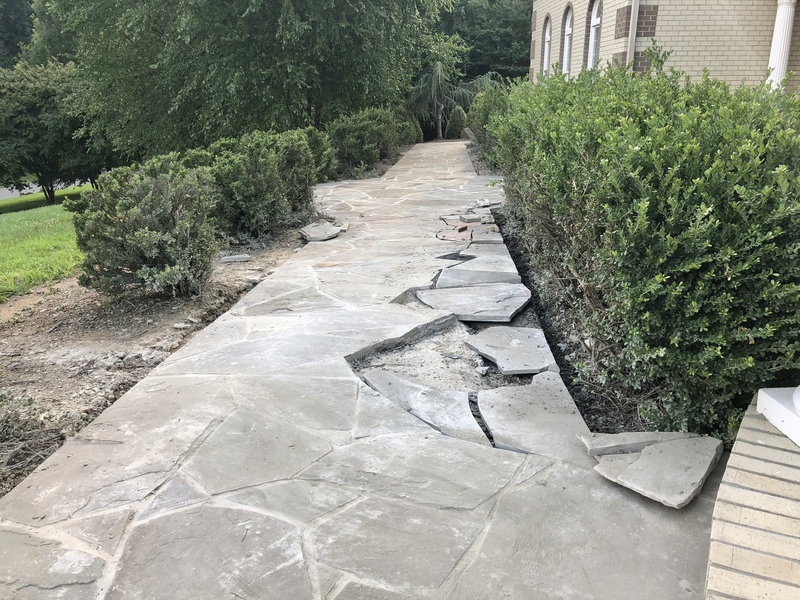 The correct fix involves removing the stone on the right side of the back portion, laying new concrete and extending the walkway farther to the right so it aligns with the front portion. To fix the misalignment on the left side, we will cut off a couple inches of the walkway. The end result is a great improvement in appearance, and I was glad I had that difficult conversation. Have you ever settled for something you weren’t happy with to avoid a confrontation? For more informative posts about outdoors and gardening, subscribe to Happy Haute Home and follow along on Pinterest HERE, and Twitter HERE and feel free to pin and tweet your favorite pics from Happy Haute Home. Lol, why is it we are all apprehensive having those awkward conversations? You are fortunate the company stands behind their work! Much better now. Thank you. Yes, the conversations are very awkward especially if they don’t volunteer to fix it! Then it gets mega awkward! It does look much better. I never really noticed it until you pointed it out, but having seen it, you can’t unsee it, so it is good you confronted them and got it fixed! I have settled, just to get rid of the person, and then over time learned to ignore the flaws, but they weren’t major things. I didn’t notice it either until the bushes were trimmed back. They probably should have been trimmed from the get go to avoid all this. Thanks for visiting my friend.